His descriptions of Lakeland mountains are peppered with the phrase ‘should not be climbed in mist’. Sheffield Pike is one such fell and the warning in this case is apt; not because of any obvious danger, but because its appeal lies in its views rather than any intrinsic worthiness of the hill itself. Mapping and route data for this walk are available on our grough route system. This includes the route, profile, timings and other information, which can be customised to your own fitness levels. Key in Sheffield Pike to the route search. An excursion up Sheffield Pike and the neighbouring Glenridding Dodd is ideal for a walker without too much time but who wants to savour the fine upland scenery of the Lake District from a grandstand position. Modest in height at 675m (2,215ft), Sheffield Pike can be gained from Glenridding in an afternoon, with a return to the village in time for a teatime pint. 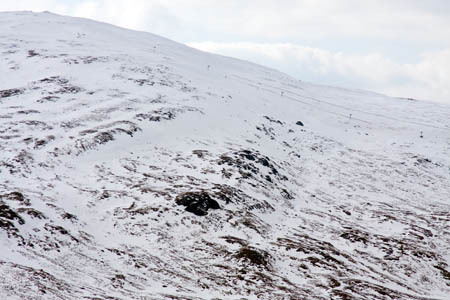 The mountain provides a perfect viewpoint for nature’s glories as well as human despoliation of the area – and a view of the Lake District’s only ski resort. The defunct silver and lead mine at Greenside is the scene of huge human scarring of the mountain. Sheffield Pike is neighbour to other outliers of Helvellyn and for much of this route Striding Edge can be seen, as can the neat outline of Catstye Cam, from this direction looking every bit the pyramidical mountain rather that its true form as the end of a ridge. Also in view are the climbing grounds of St Sunday Crag and the steep, rocky slopes of Birkhouse Moor. For list-tickers, there’s the chance to bag a couple of wainwrights and a hewitt. The walk starts in Glenridding, where there is parking either in the national park car park or a few other places. Head up Greenside Road, past the Travellers’ Rest pub and follow the gently rising road to Rake Cottages. The fellside can be accessed from behind the row of cottages and the path heads steeply up The Rake, skirting Blaes Crag, to the col between Heron Pike and Glenridding Dodd. Those in a mad rush can turn left on reaching the wall and head up the ridge towards Heron Pike. 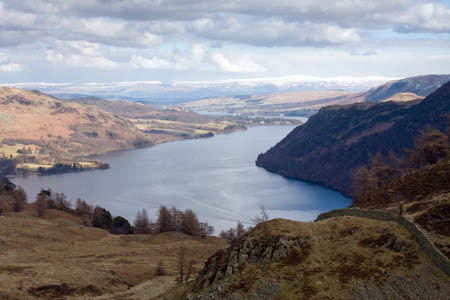 But the detour to Glenridding Dodd is short and worth the small effort for probably the best view there is of Ullswater. 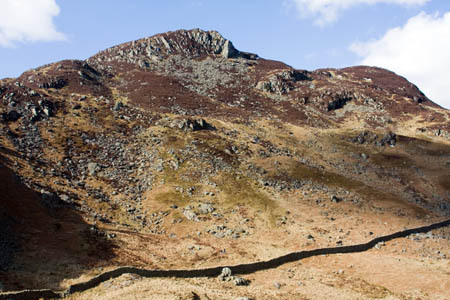 The path follows the wall briefly before striking upwards to the heathery top of the dodd. A rocky outcrop with a small pile of stones marks the 442m (1,450ft) high point of the hill. The view north-eastwards is the obvious draw, with Ullswater stretching out 300m (1,000ft) or so below. In the far distance, Great Dun Fell, Cross Fell – the highest point in the Pennines – and the northern fells heading up to the Borders fill the horizon. Place Fell fills the eastern view while further south Angletarn Pikes, High Street, Thornthwaite Crag, Caudale Head and Stony Cove Pike are all in view on a good day. Closer-by, the cone of Catstye Cam peeks out to the right of the craggy slopes of Birkhouse Moor. Retrace your steps to the col at the head of the Rake, enjoying good views of the crags of Heron Pike. Keep to the south side of the wall and follow the path towards the south-east ridge, which crosses the tumbledown wall and then heads upwards. Progress up the broad ridge is easy, with just a few places where hands have to come into play and no sense of exposure. Enjoy the improving views towards Helvellyn as height is gained, with Striding Edge coming into view, to the left of the pyramid of Catstye Cam, testament to the volcanic origin of the area’s mountains. The iron post on top of Heron Pike is marked with the date 1912 and the initials H and M denoting the Howard and Marshall estates respectively. 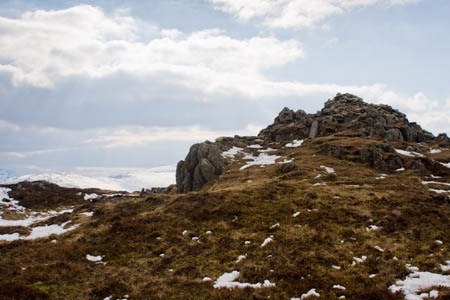 The route to the highest point of Sheffield Pike is across gently rising, boggy ground to another rocky outcrop with a pile of stones – no trig pillar – and another H-marked stone post. 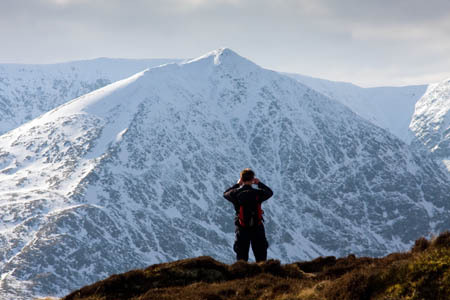 If you have disregarded Mr Wainwright’s caveat and ascended in mist, use a compass bearing to locate the summit. Black Crag to the North and Glenridding Screes to the South are obvious hazards, but the roughly oval summit plateau provides easy walking, if boggy in parts. Glencoyne, the valley directly to the North of Sheffield Pike, rises to the craggy heights of Glencoyne Head, leading the eye to White Stones and the massif of Stybarrow Dodd. West of Sheffield Pike’s summit, the disused chimney that served the leadmines rises up the hillside. Beyond this the ski-hut and ski-tow of the Lake District Ski Club adorn the northern slopes of Raise. A feint path leads from the summit towards Nick Head and the footbridge above Lucy’s Tongue. The path degenerates into boggy moorland lower down the slopes until it meets the spoil heaps and desolation of the old mines. Use the bridge to cross Swart Beck and head left down the gill side towards Greenside. The scene here is one of major rural industrial activity. The mines operated from the late 18th century until 1962, with an estimated 2½m tons of ore extracted, mainly lead, but also some silver. It was also the site of an abortive underground seismic experiment by the nuclear authorities in the 1960s. At the old mine buildings, now used as a bunkbarn and bases for outdoor pursuits, the various paths from Helvellyn are met. 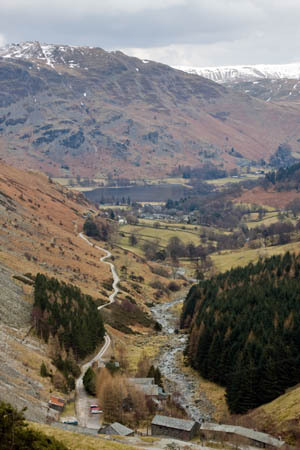 Make to the left and then follow the track past Helvellyn Youth Hostel for an easy stroll back to through Glenridding to reach the village which bears its name. We had a good walk here last monday (bank holiday). we walked this route but extended it up to Spybarrow Dodd and then down Sticks pass. Overall a little over 7.5 miles. Some excellent viewpoints and a good top on Sheffield Pike for an early lunch. Walking at a leisurely rate saw Glenridding Dodd at 10am, Sheffield Pike at 12pm and Spybarrow at 2pm. 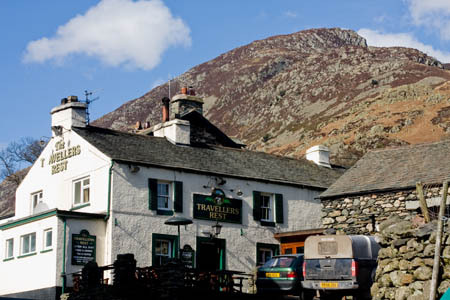 We returned to the Travellers Rest in Glenridding for a pint of Helvellyn Gold and an excellent chicken curry.